On Saturday at 10.28pm, Tory MP Ben Bradley tweeted his apology for making a defamatory statement about Jeremy Corbyn. 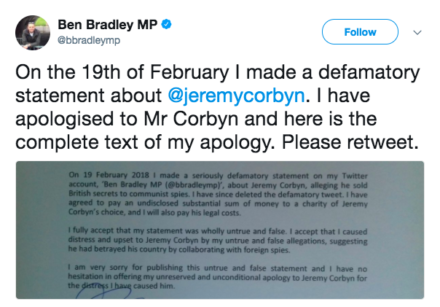 Bradley apologised: “On 19 February 2018 I made a seriously defamatory statement on my Twitter account, ‘Ben Bradley MP (@bbradleymp)’, about Jeremy Corbyn, alleging he sold British secrets to communist spies. I have since deleted the defamatory tweet. I have agreed to pay an undisclosed substantial sum of money to a charity of his choice, and I will also pay his legal costs. Following the Sun‘s “Commie Corbyn” story, which claimed the Labour leader met with a communist spy in the 1980s and suggested he briefed them on British politics and matters of state security, Tory vice-chair Ben Bradley tweeted the libellous statement that “Corbyn sold British secrets to communist spies”. The Tory MP deleted his tweet after Corbyn threatened legal action. He has now also agreed to make a substantial donation by 3rd March to charities of Corbyn’s choosing – a homeless charity and a foodbank in Bradley’s own constituency of Mansfield – and to meet the Labour leader’s legal costs. Corbyn’s team said: “We are pleased Ben Bradley has admitted what he said was entirely untrue and apologised, and that charities in Mansfield will benefit. Bradley urges Twitter users to “please retweet”. It would be rude not to do so.